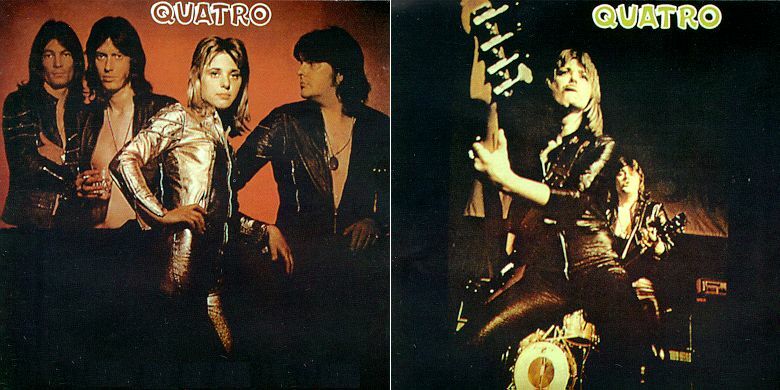 After the electric vitality of its predecessor and the prepossessing energy of her first four singles, Suzi Quatro put out a second album that was a dreadful disappointment, the fault — one assumes — of having been cut so quickly after its predecessor that nobody involved in the process had time to even catch her or his breath. Just two Quatro/Tuckey originals make it on, and one of them, "Klondyke Kate," is little more than a throwaway, while Nicky Chinn and Mike Chapman's contributions, too, are uncharacteristically lackluster — the still vital "Devil Gate Drive" notwithstanding, of course. Of course, there are mitigating circumstances. The Chinnichap duo itself was in transition at this time, trying to retool a super-successful but hideously hidebound writing formula toward a less glam-entrenched listening audience. The recently discovered Smokie was to be the prime beneficiary of this new attitude, but the next few Quatro singles, too, reflected the then-prevalent belief that "mature" songs were the way to go — and "mature," in those days, meant not having quite so much fun as they used to. Neither "Too Big" nor "The Wild One" are classic Quatro, even if the performances themselves are as committed as ever, while the dour mood conveyed by those efforts is only amplified by the strictly unimaginative choice in rock & roll covers that complete the set. Every bar band in the land cut its teeth on "Keep a Knockin'," "Trouble," "Move It," and "A Shot of Rhythm and Blues." Very few were still playing them two albums later. Only a wild, and wildly unexpected rendition of "Hit the Road Jack" truly salvages the show, and that's not really saying much — novelty songs always stand out when there's nothing else to laugh at. Ultimately, of course, Quatro would be seen as a mere hiccup in a career that had many, many years left to run — and many more twists and turns to take. At the time, however, another monarch had quietly slipped from its throne, another spangle had dropped off the glam rock crown. It really was all rather sad. — Dave Thompson. (Spoken: "All my life I've wanted to be somebody, and here I am. I'm the wild one. Yes, I'm the wild one. (Spoken: "This song is dedicated to all you 16 year-old girls out there. You just got to sit back and be cool and tell 'em one thing"). (Spoken: "Now on this next bit here I want everyone to sing along with me. It's very easy. All the boys gotta sing "You keep a-knockin'' and all the girls gotta sing "But you can't come in". You got that? Let's try it"). I'm a savage tramp, don't camp, don't vamp with me. (Spoken: "Oh, baby. If this is a game your playing, then you just keep on playing. But if it's not, don't ever hang me up"). No more. No more. No more. No more. Am I just one of the crowd? Now I'm not one... one of the crowd? (Spoken: "Hey, you all want to go down to Devil Gate Drive? (Spoken: "Come on, boys. Let's do it one more time for Suzi! Come alive. Come alive, Yeah!